People are always asking me, "What should I see right now?" And I'm always happy to answer: what you should see right now is The Barber of Seville at Boston Lyric Opera - a big, blooming bel canto extravaganza that you can only catch through Sunday. This is Rossini as it was meant to be heard and seen - with ripe voices, bold colors, a high musical finish, and a frisky sense of fun. Premiering just weeks after the brooding chamber opera The Lighthouse (itself a triumph in its own way), Barber offers proof positive that BLO, always Boston's leading opera company, is now ready to step up to the plate as its only opera company, with an artistic reach that convincingly stretches from the esoteric to the populist and back. Although all that aside, this Barber is just a great night out - and trust me, we won't hear bel canto like this, with voices like these, for some time to come (or at least not until BLO returns to the genre). If this sound like I'm purring, well I am - this is the kind of production you can sink into confidently; it's a big plush easy chair of memorable melody (you already know the whole overture, in fact) and rollicking comedy. I suppose you could sniff at the fact that this is a "traditional" rendering, and nobody involved is trying to subvert Rossini's sturdy commedia structure with some intellectual agenda or other, to prove they went to Columbia or Harvard. But what can I say? If that's the way you think, well, you know where you can go (and it ain't Columbia or Harvard, much less the opera house!). I know, I know, people want to drag into Barber something of the complexities of The Marriage of Figaro, the second play in the Beaumarchais trilogy which, of course, inspired Mozart's revolutionary opera of the same name. But I'm afraid that wider intellectual dimension isn't really to be found in Rossini's source - and me, I'll take this composer straight, with his sunny melodies, lusty sense of romance, and yes, weakness for slapstick, any day. The slapstick's about to start! Pass it on! From the start, frankly, I knew this production was in clover; even as the pleasingly rambunctious stage business began, conductor David Angus was drawing a rich, elegant sound from the pit. Likewise the drops and costumes, by Allen Moyer and James Scott respectively, appropriately evolved from a warm romantic realism to a sense of heightened satiric sketch (as the pratfalls piled up around the characters), and stage director Doug Varone proved he knew just how to shift that balance, too - even if his inventiveness flagged slightly before the final act was over, we didn't really mind by then. And the voices! As was the case with Agrippina last spring (another big, bold comedy - BLO has a feel for this kind thing), the world-class warbling just keeps coming in The Barber of Seville. As the eponymous hairdresser himself, Jonathan Beyer deployed a rich, resonant baritone that seemed warmed from below with sun, and he beamed with just the right mix of lustiness and fey wit, too. Believe it or not, however, he may have been slightly out-classed by Sarah Coburn's Rosina, and Steven Condy's Dr. Bartolo. Coburn's flexible mezzo (as is often done, the role was transposed up slightly from its original range) is dazzlingly pure, and she has startling reserves of power; plus she, too, is no comic slouch. The comedy laurels, however, have to go to Condy, who as Rosina's would-be suitor/captor expertly teased both our ridicule and sympathy in about equal measure; and as an added bonus, his deep baritone is tinted with an intriguingly dark, individual color. Indeed, the only (slight) vocal gap among the leads lay in tenor John Tessier's turn as Count Almaviva. Tessier has a flexible lyric tenor, with a radiant bloom in the middle of its range; but it's perhaps slightly too light for what it has to accomplish here, and Tessier was showing signs of strain by the finale; which is too bad, because he looks just right, and has a sweet way with romantic comedy to boot. But then he had stiff competition from what amounted to a talented squad of hammy farceurs, including the memorable Judith Christin, whose bug-eyed servant drew laughs every time she entered. 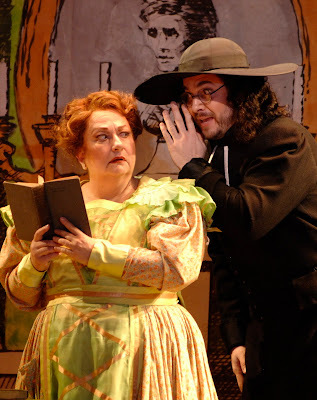 Alas, local bass David Cushing (with Christin, above) eschewed his big aria as Basilio, the music master, as he was suffering from a head cold on opening night (just like, ironically enough, his character supposedly is) - although honestly, he managed pretty well in his ensembles. 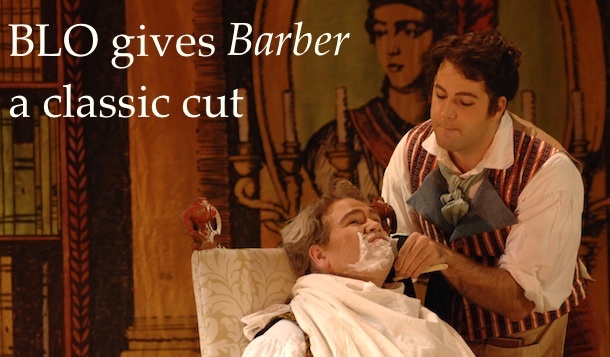 The chorus, which we only heard from occasionally, was likewise in strong form - there was a palpable sense from everyone onstage, in fact, that this was a production to be proud of; somehow they all knew they were giving The Barber of Seville a classic cut. John Tessier and Sarah Coburn are finally wed, with a little help from the infantry.